Matt Forde is a comedian, impressionist, comedy writer, and radio presenter. 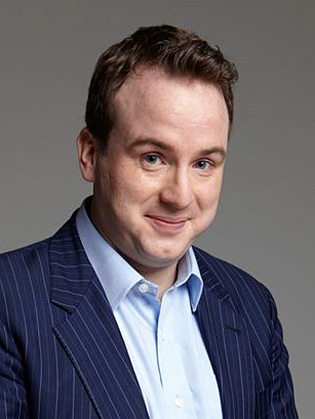 Matt Forde began his comedy career in 1998 at the age of 16, performing at gigs in his hometown of Nottingham while working for the East Midlands Labour Party. With his political views forming the backbone to his stand-up, Forde debuted his hour-long show, Dishonourable Member, at the 2011 Edinburgh Fringe. Matt Forde is one of the country’s most in-demand satirists, having appeared on The Royal Variety Performance 2015 (ITV), Have I Got News For You (BBC One), Mock the Week (BBC2 Two), Rory Bremner’s Coalition Report and Election Report (both BBC Two), 8 out of 10 Cats (Channel 4), Question Time (BBC One), This Week (BBC One) and Jon Richardson Grows Up (C4). Matt’s monthly residency in London, The Political Party, regularly sells-out Westminster’s St James Theatre. Alongside Matt’s trademark up-to-the-minute current affairs stand-up, the show brings Parliament to life as Matt interviews some of politics’ most significant characters. Past guests have included Tony Blair, Alastair Campbell, Nigel Farage, Michael Portillo, Dame Tessa Jowell, John Prescott, Alan Johnson, David Davis, Stella Creasy, Jack Straw and George Galloway. The show is also released as a podcast which has amassed over 100,000 downloads on Soundcloud, hit the top spot of the iTunes comedy chart, was picked as the Daily Telegraph’s podcast of the week, and was nominated for the Internet Award in the 2015 Chortle Awards.